For far too long, I have been on the search for the ideal way to distribute power for low voltage systems, typically 12V. I have an small assortment of domestic networking gear, small embedded systems, LED desk lamps, battery chargers and USB chargers that operate from a backed-up 12V PV solar supply. I have finally settled on the “Powerpole” 15-45 connector from Anderson Power Products. The 15-45 denotes that the connector comes with terminals rated from 15 to 45 Amp. The housings are designed for voltages well exceeding 100V AC or DC depending upon your choice of UL or IEC certification. This well exceeds my requirements. The connectors are genderless. Both mating sides of the connector are identical, but by flipping one connector the tongue will mate with the groove of the other. After a small investment in a crimp tool, the genuine connectors are relative cheap. For the crimp tool, I purchased the IWISS AP-11. The regular price is $34.99 USD. Housings cost about $0.50 USD in single quantities from catalog companies such as Mouser. Crimp pins are less than 25c. This totals to about $1.50 USD per 2 pole connector. 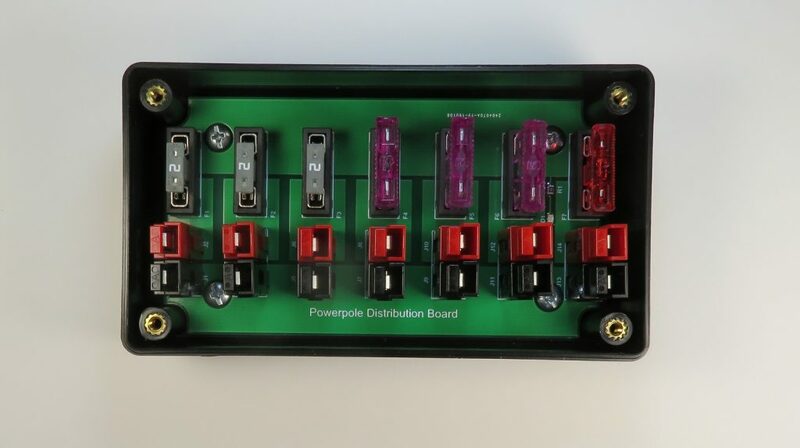 Anderson Powerpole connectors are popular with Ham radio operators who also commonly operate their equipment from 12V. But, while the connectors are genderless, you can configure the polarity. Ham operators have established a convention, so I thought it was worth following it. 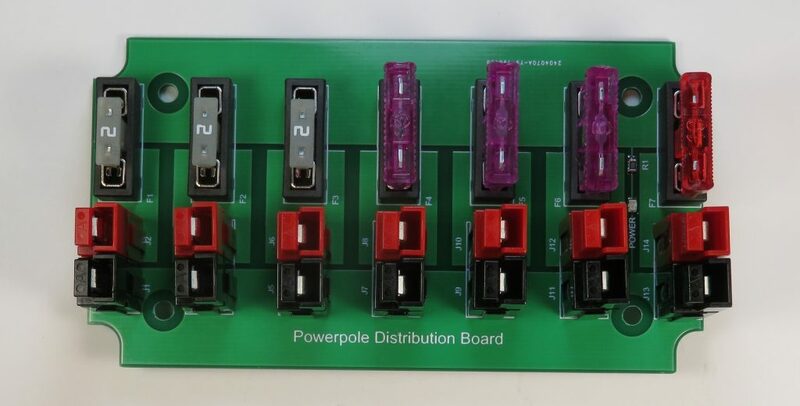 As Ham operators commonly use Powerpole connectors for low voltage distribution, you can purchase Powerpole distribution strips (e.g. RigRunner) off the shelf. However, they don’t come cheap. So like many others, I decided to spin my own. 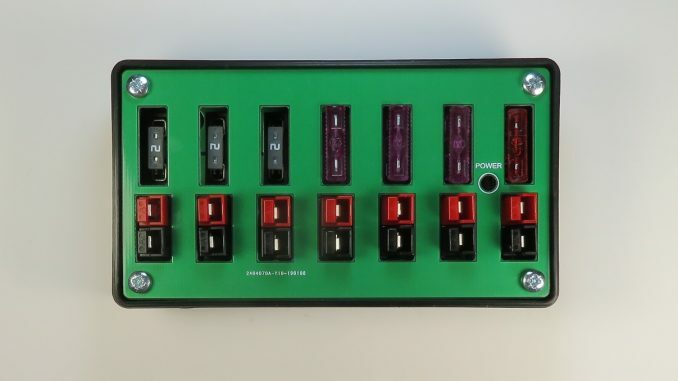 This project consists of two PCBs designed to fit into a Hammond 1591XXB enclosure. The enclosure comes complete with an ABS lid. It would be possible to mill the lid of the enclosure, but as I do not have a CNC mill, a PCB lid was more achievable, and just as functional. 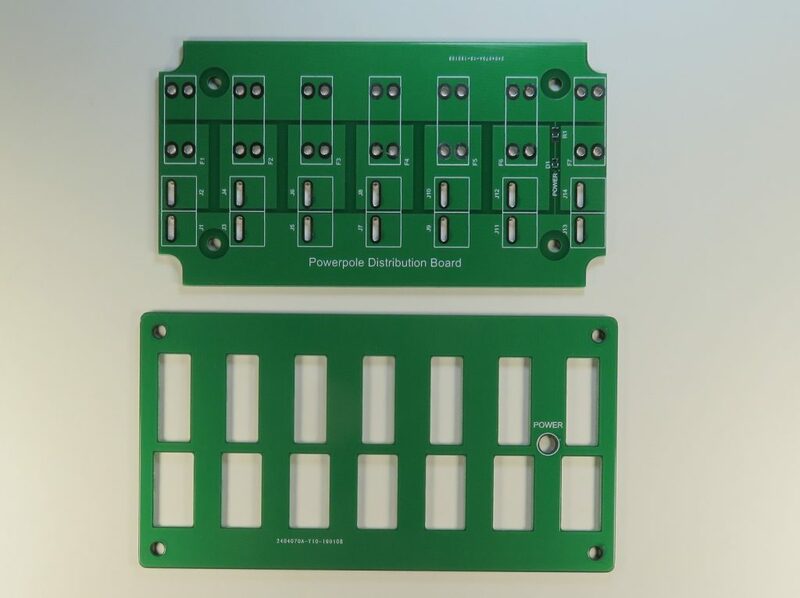 The design consists of a conventional electrical distribution PCB and a routed lid. As pictured, the Keystone 3557-2 fuse holders will accept both Standard Auto Blade Fuses (.205 x .025) or Compact Mini Auto Blade Fuses. Standard Auto Blade Fuses include Littelfuse ATO 257 series, Bussmann ATC series / APR are generally rated for voltages up to 32VDC. Mini Auto Blade Fuses include Littelfuse 891 and 897 series, Bussmann ATM-LP series and are generally rated for voltages up to 58VDC. Assembled Power Pole Distribution PCB fastened into the Hammond 1591XXB enclosure.